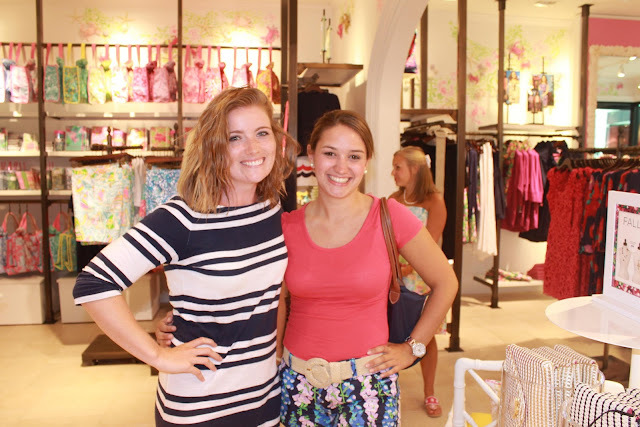 Last night my friend Leesa and I visited the new Lilly Pulitzer store in Towson Town Center. 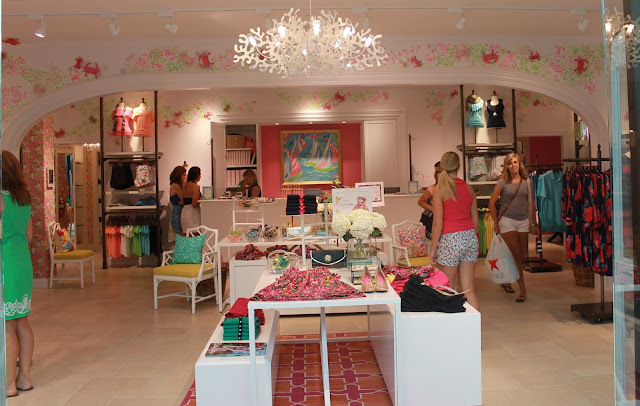 The store entrance is pure glass, offering a full view of the latest that Lilly has to offer. I love all of the pink and green touches in the store. 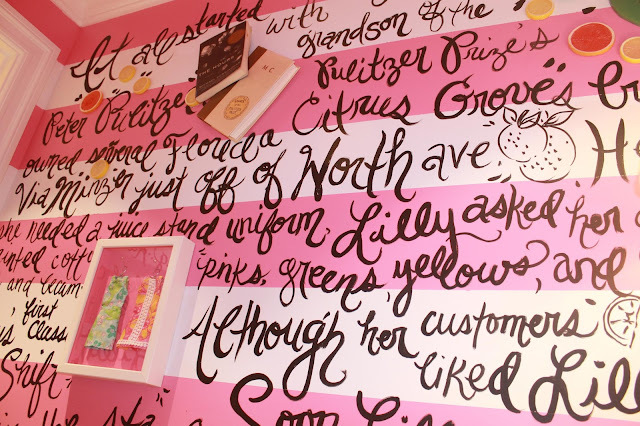 One of the Lilly peeps explained to me that each corporate store tries to incorporate a bit of the local flavor in the decor and atmosphere. They did a fantastic job with the Maryland theme! All of the sorority totes are so cute! Fellow Phi Mu sisters, do you spy our gorgeous pink print, the fourth one in from the right? Greek life is important at nearby Towson University, with over a dozen sororities represented on campus. If you've visited several Lilly Pulitzer stores, you'll notice that the dressing rooms in every corporate store share common themes. One dressing room tells the Lilly story. 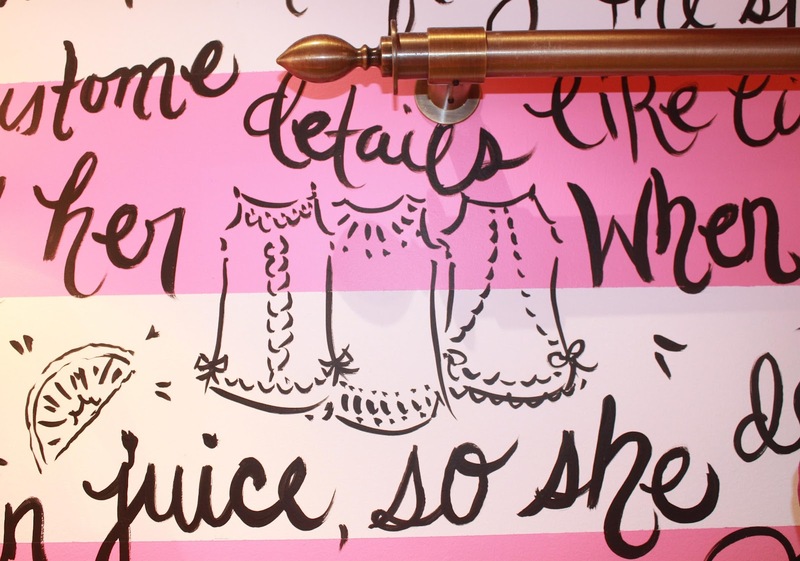 At the Towson Town store, "It all started with a juice stand..." pops to life with fruit slices, Pulitzer Prize winning books, and iconic shift dresses. These three shift dresses caught my eye. Color stories offer another theme for corporate dressing rooms. I remembered that in the Madison Avenue townhouse, the tubes of paint line a dressing room. 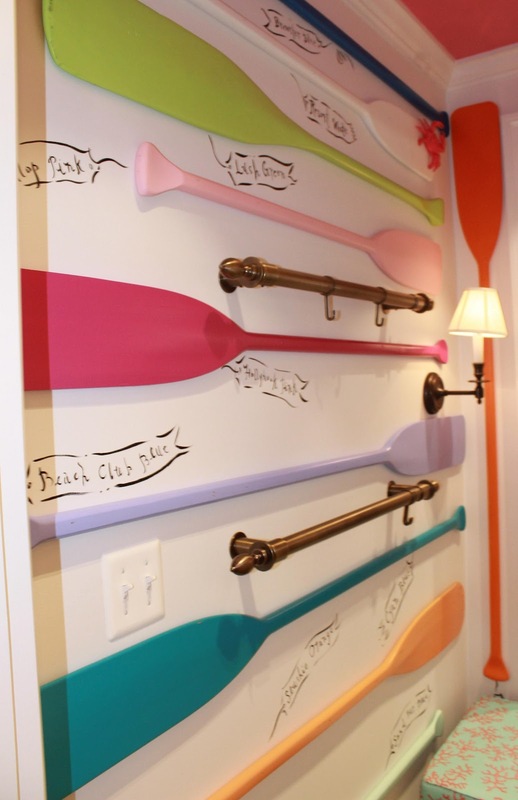 In Maryland, the designers chose oars to tell the stories of the different pinks, greens, and blues that make up the unique prints. Do you spy the lacrosse stick hidden among the oars? 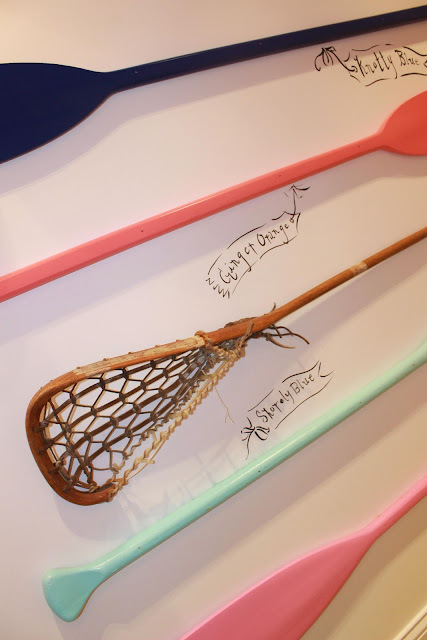 It wouldn't be a Maryland store without a lacrosse stick! The third dressing room represents the local area. 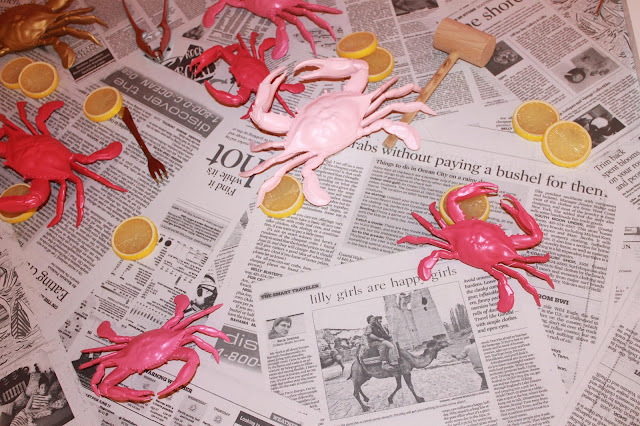 I love the crab feast theme in this dressing room covered entirely with newspaper, crabs, lemons, and mallets. The ceiling is covered with mallets, too! When I looked carefully at the newspaper, I noticed local personalities like Orioles infielder Wilson Betemit. Do you see the headline that "lilly girls are happy girls?" Lots of Lilly lovers were at the store! Here are some of my favorite peeps from the evening. I even met fellow blogger EAS from Let the Tide Pull Your Dreams Ashore! Plenty of sweets and treats tempted guests. 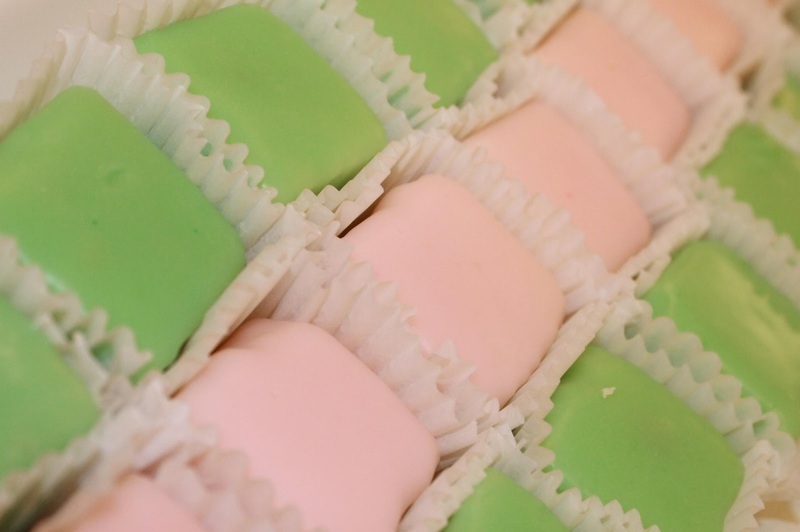 These pink and green cakes were delicious. Of course there were crabcakes, too! 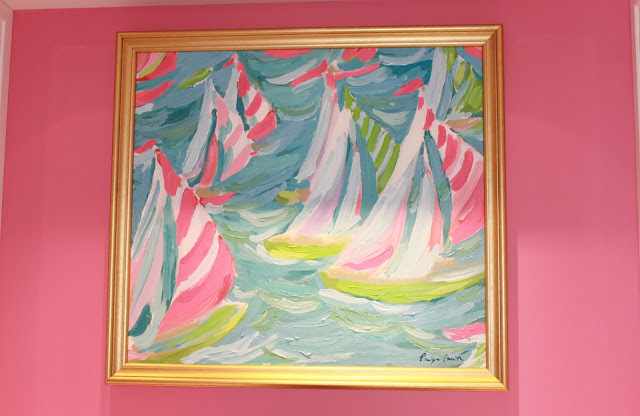 Paige Smith painted this image of sailboats that hangs behind the cash registers. The design team from King of Prussia traveled to Towson to paint the walls, dressing rooms, and bathroom before the store opened. The pink and green Maryland touches in the newest corporate store are a dream come true for me! What do you think of the new store? Today Lilly Pulitzer at Towson Town Center officially opens doors to visitors. The grand opening celebration will be held on August 25 and 26. 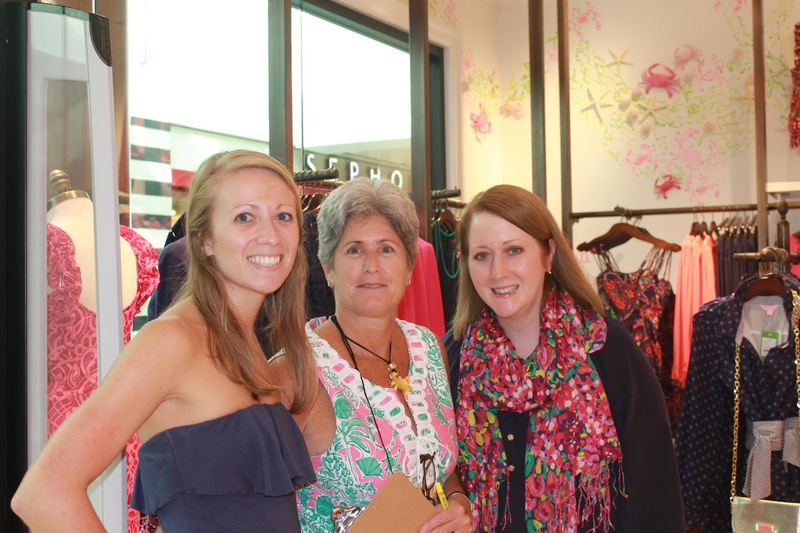 At the grand opening celebration, Lilly lovers can see live painting from the Lilly Pulitzer Print Designers, have the opportunity to win mystery gifts, and take home special gift with purchase items. Will you be visiting Lilly Pulitzer at Towson Town Center? Oh.my.stars! Okay, totally choked on my peanut butter and jealousy sandwich! I need to come visit stat! What a gorgi store! Eeeeeeeeeeeeegads! You look smashing by the way! Great photos, I have been waiting for this store since the Pink Crab closed in Ruxton! Can't wait to visit after work today! Lovely post! Thanks for all the great pictures! It is such a great store! You'll all have to let me know what you think once it opens! Nelle ~ It was fabulous to meet EAS. What a gorgeous store. Thank you for sharing so many photos w/ us. 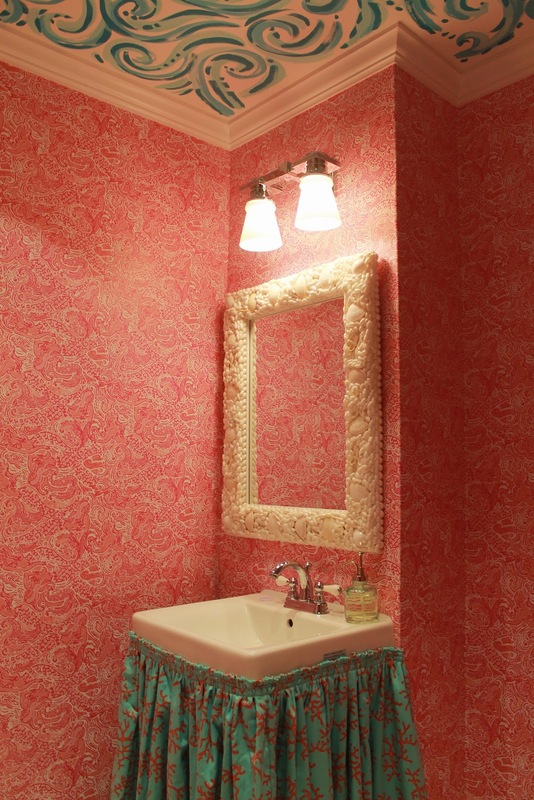 I love the shell mirror in the powder room. 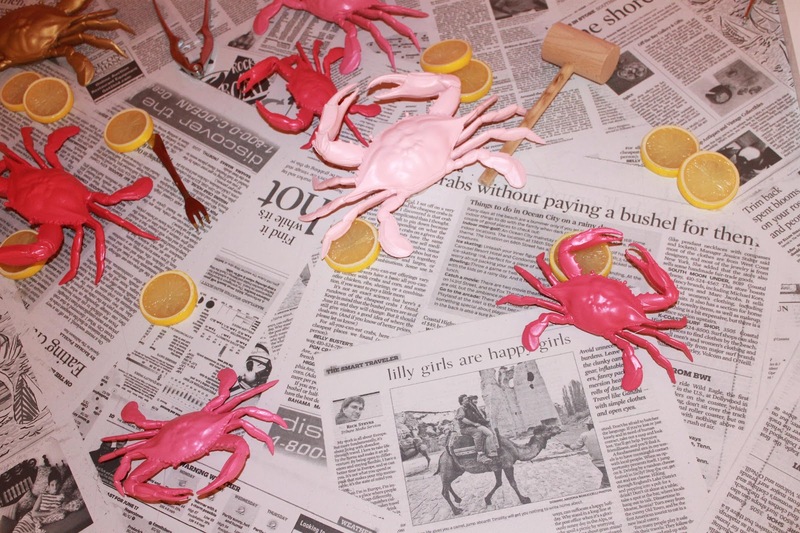 I love it especially the crab themed dressing rooms. And can I please have that last painting for my house?! Can't wait to check out the store! So many cute things...thanks for sharing! I love all your pics! Looks like you had a fantastic time. I may have the the drive up I95 the weekend after next to check out the opening celebration. This store is just too cute and you and EAS look fabulous, as usual!